Columbia has always had a Paris Road, but that’s about as close to the magical City of Lights as we come. Well start rejoicing, Francophiles, and brush up on your français while you’re at it — there’s a new restaurant in town that can fill CoMo’s culinary void. Local entrepreneur/restaurateur Adam Guy has arranged for Columbians to experience a très magnifique French dining experience at Brasserie, Guy’s new restaurant at 3919 S. Providence Road. The location also houses the newly relocated Upper Crust bakery and new Champagne Ballroom event space. Guy says he wanted to create something new for Columbia, with a place where visitors and locals would want to go and where people would want to bring their friends from out of town. Brasserie was designed to transport diners to a Parisian café. Its décor boasts a pale blue ceiling strung with bistro lights and a painted streetscape that’s strikingly realistic. Lampposts anchored in the floor — and a 12-foot windswept olive tree, made by the people who create the faux trees for Walt Disney World — add to the effect. Although Guy focused on capturing the experiential flavor of a Parisian café, he didn’t forget to capture the flavor of authentic French fare as well. The goal for Brasserie was to create a menu that delivered on a more casual French bistro concept, rather than a five-course, white-linen experience. “It’s a more sociable environment,” Hudson says. The menu features many standard French favorites, including Onion Gratinée, a crêpe du jour, Salade Niçoise, Croque Monsieur and Coquilles St. Jacques. A raw seafood bar will offer plateaus in three sizes that serve anywhere from two to eight people, as well as à la carte seafood items. “Part of the bistro experience is shareables,” Hudson says. 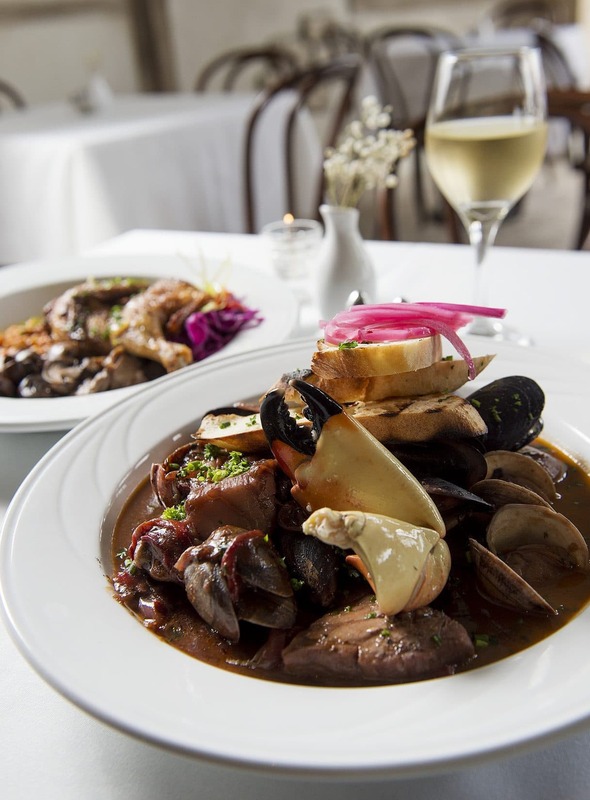 Brasserie accepts reservations and is open nightly for dinner. The menu and other details are at www.BrasserieUC.com.